UPDATED: I found my local copy of the 2009 Direct Energy buyout schedule. This is more relevant given the recent Direct Energy Rental Terms Change fiasco. If you currently rent your water heater from Direct Energy, and you haven’t yet received your December 2009 bill, brace yourself. 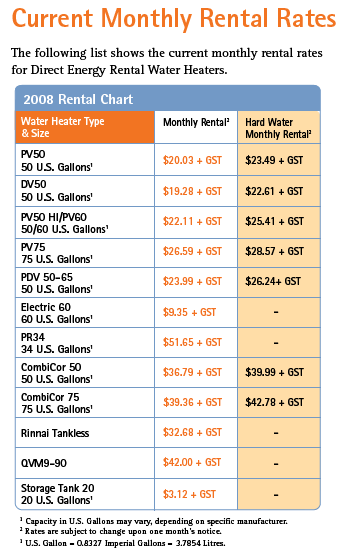 Direct Energy’s water heater rental rates are going up. In some cases (like mine) – way up. Currently I am renting a Polaris 34 U.S. Gallons natural gas hot water tank. According to the pamphlet I received, my rental will be going from about $40/month to $62.34/month. An increase of approximately $22/month! Now, I know I have posted a fair bit about the problems I’ve had with my Polaris unit that I rent from Direct Energy. My only guess for Direct Energy’s 55% increase (is it really that much!?!) on my Polaris rental is due to the number of issues that they have had. 1 Capacity in U.S. Gallons may vary, depending on specific manufacturer. U.S. Gallon = 0.8327 Imperial Gallons = 3.7854 Litres. 2 Rates are subject to change upon one month’s notice. Plus GST. Ugh! From the same link above, I also found the 2009 Direct Energy rental water heater buyout schedule [PDF – no longer available]. According to that, my ~5 year old Polaris 34 Gallon tank would cost me around $3700 + tax to buy. Double Ugh! UPDATED: I found my local copy of the 2009 Direct Energy buyout schedule. I managed to dig up the following 2008 rental rate information but it doesn’t seem to jive with what I am currently paying. I guess that means I’m stuck paying $62/mon until my whole system craps out and I really have to replace something. I had a furnace quote a while back and it came in around $8000 to replace my system (including a new hot water tank of some sorts). This entry was posted in General, Review and tagged Direct Energy, energy saving, gas hot water, polaris, Review on 2009/12/15 by Jeff Ivany. I am in the same situation. I have a Polaris 34 and I lost my mind when I saw the new published prices. I called Enbridge to enquire and they basically told me that my new rate would not be 62.34, but something like 42. Just like your charts above, you and I should be paying $51 for our tanks now, but are only paying $40, and the rates are only going to increase about 2% according to the data on file for me. The justification given to me was that I had some kind of “special pricing consideration” in place. Fantastic news Stacey! I haven’t had a chance to call Direct Energy myself (holidays and all) so I’m hopeful I’ll get the same response. Maybe the rates are for new installations and those of us with the units already get grandfathered in to some maximum increase? Jeff – check out the Kingston Utilities website (www.utilitieskingston.com). They have a NRCan-sponsored programme which applies throughout eastern Ontario (i.e., not just Kingston) that rents Viessmann wall-hung natural gas (or propane) boilers and Viessmann solar thermal equipment. Even though the units are rented they are elligible for the same NRCan grants under the ecoEnergy programme which usually more than covers the installation costs. I’ve worked with the Viessmann equipment and think they’re very good. Nic, I just looked at the site and they mention that there is “An allowance equal to $2,500 for a residential solar domestic hot water system is available through the ecoEnergy Retrofit program.”. Given your certification, can you confirm that? ;) I looked previously and it appeared the maximum for solar hot water was only $1000 ($500 from Federal and $500 from Ontario). Hi my name is Paul. I found a company called morEnergy. They are one of the competitors to Direct Energy. MorEnergy does fixed rate rentals on ten year contracts. After 10 years you can choose to get a new tank with them, buy the tank for a good price, or rent the same tank for 50% less. They will bring the Direct Energy tank back to them and put a higher efficiency tank in the home instead. The rental is an average of $5 more per month, but its fixed and since its a better tank you save it back on the gas portion of the bill. Recenthly I bought house, Can you advice me about what best for water/gas/hdyro? I don’t know anything for water/gas or hydro. I have a polaris as well and my new rental rate is $62 dollars per month. I plan to call Direct Energy to pick up their tank soon. I will rent with a local company. Kevin, are you replacing it with another Polaris? Who are you considering locally?